NOTE: VIEW PG RATED "BLEEPED" VERSION OF TAKEDOWN VIDEO HERE. OMG YOU GUYS DID IT! LOOK FOR AN UPDATE LATER TONIGHT! This project, working title TAKEDOWN, aims to change that. This game, the spiritual successor to games like the original Rainbow Six and SWAT series, will focus on realistic weapons modeling, squad based play, in a close-quarters battle setting. To succeed in this game you need to take things slow, study your plans, and execute flawlessly. If you get shot, there are consequences. You won’t be hiding behind a wall waiting for your health to regenerate. If a team member goes down, you will have to assess the situation and reallocate team members if necessary to complete the mission. Don't expect all of the tools and plans to be forced fed to you - it is up to the player to ensure their team is equipped and ready for the tasks at hand. TAKEDOWN is a thinking-person’s shooter. The player that takes things slow, aims carefully, and plans their moves right will overcome the player who runs in with guns blazing. Close-quarters battle brings the fight inside, as you would see SWAT teams or SOF units taking down small numbers of dangerous adversaries. Non-linear environments allow for multiple routes and tactics and add replayability. The operation to clear pirates from a hijacked oil tanker by Russian special forces in May of 2010 is a perfect example of the types of missions in TAKEDOWN. You will plan your insertions and routes before going into the scenario, outfitting your teammates with weapons and equipment of your choosing, and then execute the mission. If one of your team members is killed, they are gone, and you have lost their valuable experience, so you have to be careful! Gameplay modes include single player, co-op, and competitive multiplayer. If you are a fan of old school shooters where thinking meant more than running and gunning or perks, or if you are just looking for something different in your shooter games experience, this is the project for you. What types of play are planned? How about camera view? TAKEDOWN plans a single player campaign, co-op play, and competitive multiplayer. First Person view is planned on PC, with PS3 going Third Person. Xbox 360 view is to be determined based on feedback from the 360 community. What is the setting of the game? Who will I be able to play? TAKEDOWN is set in today’s world, with no sci-fi or future elements. You take the role of PMC’s (Private Military Corporations), taking on scenarios all over the world for a variety of employers with various objectives, including hostage rescue, asset recovery, security, and target elimination. You will have operatives from many different countries and backgrounds, and will outfit them with weapons and equipment from all over the world. What platforms are we talking about? What platform is the lead? TAKEDOWN will be developed on PC as the lead platform, and then brought to consoles afterwards. Linux and Mac versions are under evaluation, based on demand from those communities. PC will have a DRM free version available. How is TAKEDOWN different from Ghost Recon: Future Soldier, Rainbow Six: Patriots, Call of Duty, Battlefield, or ARMA? GR: FS focuses on future tech and using gadgets to reveal the locations of your enemies. R6:P looks to provide a “Jack Bauer” experience. COD emphasizes huge movie-like set pieces and perks. Battlefield and ARMA bring different variations on large battlefields with a variety of vehicles. Compare these games to the description of TAKEDOWN above, and we hope you will understand the difference. What experience does the team behind TAKEDOWN have? Serellan LLC, led by veteran game designer and BAFTA Award winner Christian Allen, is a small indie studio made of industry veterans from studios including Red Storm Entertainment, Monolith, Surreal, Microsoft, Ubisoft, Bungie, and others, with extensive experience on games like the original Rainbow Six, Rainbow Six Rogue Spear, Ghost Recon, GR2, GRAW, F.E.A.R., Condemned, Halo: Reach, Drakan, The Suffering, World of Tanks, and more. Also included is a recently retired US SF Operator, with several tours under his belt who, along with Christian Allen's USMC experience, will bring realism and authenticity to TAKEDOWN. We also have Rich Douglas, composer, providing the score; Charles Guan providing concept art, and Matt Corboy (of The Shield, L.A. Noir, and The Descendants) signed to voice the Commander. How involved will the community be in the development of this game? Community involvement is crucial to the development of this title. Based on the pledge level, community members will influence different features and content in the game, as well as being able to submit content for inclusion in the game. While this won't be a "design by committee," and the development team will make the final decisions, when it is appropriate to open it up to the community for things like available weapons, community members will have opportunities to vote and discuss with dev team members before the final decisions are made. What will the $200,000 be used for? 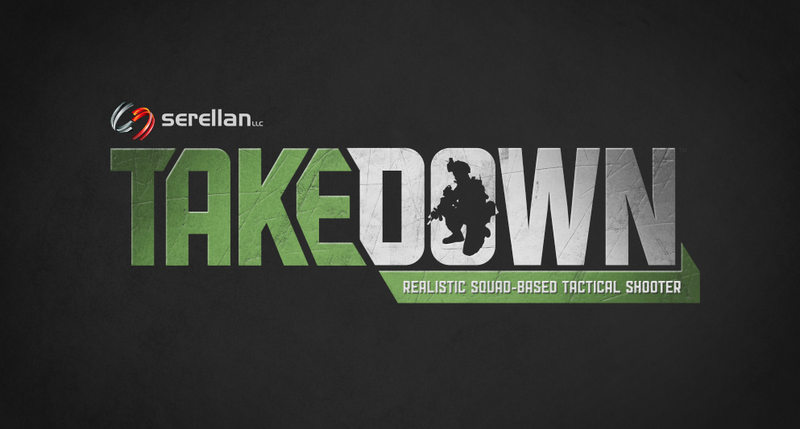 $200,000 will bring TAKEDOWN to Alpha. Private investors are lined up, but unsure of the market for an old-school tac shooter. A successful Kickstarter campaign will convince them that this is a viable market. Along with their investment, pre-sales of the game (A $15 Kickstarter pledge is a significant discount on the final game price) will also contribute to completion of the project. Kickstarters will have access to a closed Alpha. Take a look at the reward levels and pledge what you feel comfortable with. Then spread the word! Share this project on Facebook, Twitter, and other social media. Tell news sites you want to find out more about it. Share our website, www.serellan.com. Check out our Twitter feed at @Serellan. Thanks for taking the time to look over this project, feel free to send us any questions, or join our forums at www.serellan.com/forums and get involved!